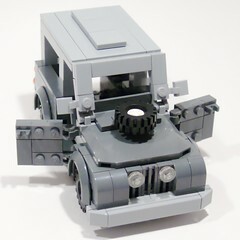 It’s a little bigger than most minifig-scale vehicles, and at 7-wide (really 8 if you include the fenders and bumper) it’s a bit big for standard LEGO roads. But I think it has all the elements that readily identify it as a Land Rover from the 1960’s-70’s era. Hope you like it. Click the picture above for more, or view them as a slideshow.